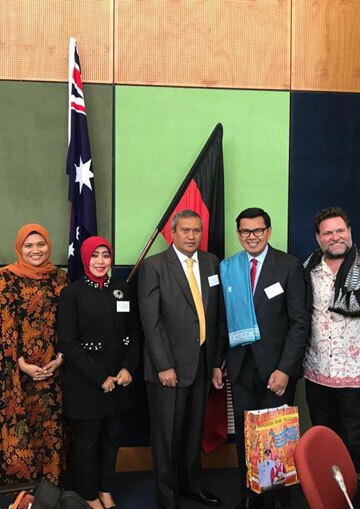 During 2017 two major international forums were held in Byron Shire which specifically welcomed Indonesian diplomatic and cultural delegations for “Indonesian forums”. The Australia Indonesia Forum Byron Shire has been initiated due to the long-standing close connection between Byron Shire and Indonesia. Byron Shire is well known to be a doorway between Australia and Indonesia through the existence of many small businesses such as fashion, tourism and cultural collaborations which have been continually growing during the last 20 years. Collaborations include cultural exchange and school exchange programs, business and products, tourism and environmental projects. During their visit to Australia AIAA also facilitated their visit and tour to Parliament House Sydney where they met the first Muslim woman in Australian Parliament Ms Mehreen Faruqi MLC. They also visited the office of Lee Rhiannon MP. The other delegates to the Australia Indonesia Forum Byron Shire included Mr Yayan Mulyana Consul General Indonesia and Consular staff, Mrs Sri Moertiningrum and staff from the Indonesian Investment Promotion Centre, Sydney. During their visit to Australia AIAA also facilitated their visit and tour to Southern Cross University where significant introductions and connections were made with all senior staff at the University. Byron Shire is the most popular and internationally famous tourist destination in Regional NSW, second only to Sydney in the number of domestic and international tourists per year. The number of visitors per year is approximately 1.7 million. Byron Bay is perhaps the most internationally famous beach in Australia reaching acclaim alongside other iconic Australian beaches. The reasons that Byron Bay has become such an important destination for tourists and travellers as well as music and culture lovers are many: Byron Shire is a very significant cultural hub and major centre for Australian Music nationally hosting some of the biggest and most successful music festivals in Australia such as ‘Byron Blues Festival’ and ‘Splendour in the Grass’. Local businesses, local agriculture and food production under the famous “Byron” brand are internationally recognised for fine quality and healthy lifestyles such as Byron Cookie Company, Byron Bay Coffee Company, Byron Bay Chocolate Company, ‘Peace Love and Vegetables’, Macadamia Land and many more. Northern NSW has the largest macadamia production in Australia as well as the cutting edge in development and innovation into new sustainable products such as hemp for clothing and building materials, biochar and sustainable agriculture, solar and other renewable energy etc. Byron Shire has been a major national hub of Indonesian language and culture during the last 20 years with many close collaborations and projects taking place between the two countries based in Byron and the NSW North Coast Region. Byron Shire based environmental organisations have raised over Aust$500,000 for projects on the ground in Indonesia for rescue and preservation of endangered species such as orangutans, Sumatran elephants, Sumatran tigers and for reafforestation projects in Kalimantan and Sumatra.